This blog post was inspired from my reading of Sara Hottinger’s book, Inventing the Mathematician: Gender, Race, and Our Cultural Understanding of Mathematics (2016). 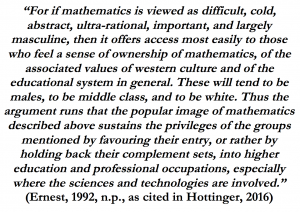 Hottinger’s book advanced my thinking about how cultural contexts of mathematics perpetuate gendered, racialized, and other systemic forms of exclusion. She adopts a cultural studies approach to examine how four sources of mathematical representations – textbooks, histories of mathematics, portraits of mathematicians, and ethnomathematics – limit opportunities for building “individual and cultural relationship[s] to the field” (p. 7). Hottinger (2016) uses the term mathematical subjectivity to refer to how individuals make sense of themselves in relation to mathematics across these four sources. Her analysis highlights how exclusionary representations of mathematics result in the “construction of normative Western subjectivity and in the construction of the West itself” (p. 6) that limit possibilities of positive mathematical subjectivities among members of historically marginalized populations. Considering the inclusion/exclusion blog’s focus on issues of social marginalization in mathematics and my research interest in increasing inclusive educational opportunities in undergraduate mathematics, I focus on Hottinger’s analysis about the history of mathematics – an area of inquiry associated with a special interest group of the Mathematical Association of America and incorporated in courses of study for mathematics majors in the United States. I begin with summarizing Hottinger’s distinction between internalist and externalist historical accounts and their respective influences on the construction of mathematical subjectivities. This is followed by a discussion of how Hottinger’s insights can be applied to re-thinking pedagogical practices in undergraduate education that challenge traditional representations of mathematics as void of sociohistorical contexts and personhood. In a time before Cambridge Analytica but after Snowden, there was a buzz in the maths hall at the University of Cambridge. Two Cambridge academics, Maurice Chiodo and Piers Bursill-Hall, together with many of their students began discussions addressing the ethical situations mathematicians find themselves, and often without much guidance or principles specific to a mathematician and the field. From these initial discussions, the Cambridge University Ethics in Mathematics Society (CUEiMS) grew into being on the campus. The mission statement and constitution of the society are on the website, but from my perspective, there are two simple threads to the mission: doing good and preventing bad. The Society hosted speakers from mathematics and computer science including Bonnie Shulman, who the organizers assert was one of the only search results when seeking “Ethics in Mathematics.” Thanks to James Franklin, Mathematics and Ethics now has a Wikipedia page adding to the relevant search results. But it was Dr. Shulman’s article “Is There Enough Poison Gas to Kill the City? : The Teaching of Ethics in Mathematics Classes” and subsequent video-linked talk for the society that opened up the conversation of ethics beyond the profession of mathematics and into both the curriculum of mathematics and social ethics. 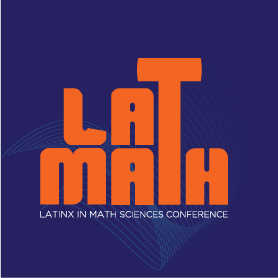 It is hard to know where to start when speaking about this conference, held this last weekend at the Institute for Pure and Applied Mathematics (IPAM) at UCLA, and organized by Federico Ardila, Ricardo Cortez, Tatiana Toro, and Mariel Vasquez. Maybe it’s because the snow storm on the East Coast prevented me from getting there for the first day, and once I got there I felt as if I was already in catch-up mode. Maybe I was overwhelmed by the joy, talent, and radical thinking surrounding every single interaction. But I think it was more the fact that, like with many amazing and busy conferences, I just have lots of memories that are more scenes and feelings than clear summaries of talks or a play-by-play of chronological events. 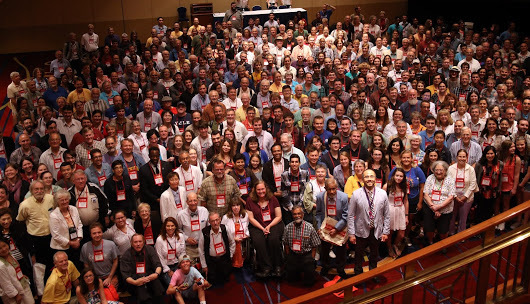 So in this post, I walk you through some of the most memorable moments from the conference. Question: What are you hoping to get out of the Workshop on Increasing Minority Participation in Mathematics? This prompt in my application to last year’s Park City Mathematics Institute gave me pause. Leading up to this question, the online form had asked for information that I am able to give on autopilot (name, title, institution, email address) as well as information that is relatively easy to speak to (e.g., how did you hear about this program?). But in considering my motivation for attending, my hopes for how I would benefit from the week-long program was a little bit harder to verbalize. It wasn’t the case that I was unsure of what I wanted to achieve through my participation – on the contrary, I had specific concerns in mind from my home institution that had incited me to apply to the PCMI workshop. Our department was just beginning to develop four new “stretch” courses that were to replace our developmental courses in elementary and intermediate algebra – two places that we most often interacted with students typically underrepresented in math before they disappeared from our program. I was also thinking of the interdisciplinary science course that I teach for first-year students. 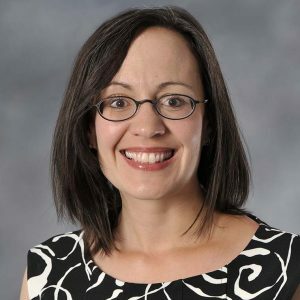 That program was initially funded through an NSF grant which, in part, was aimed at closing the achievement gap in STEM – yet the student cohorts we have been able to recruit into that class have been dominated by white males, a trend that is not observed in other comparable general education courses. Raise your hand if you were just rejected by the NSF! Fun times, right? 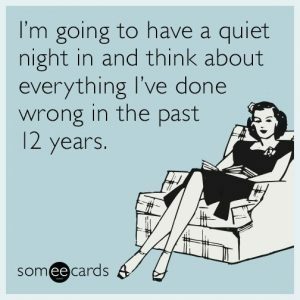 I don’t know about you, but I like to celebrate such occasions with a full re-evaluation of all of my life choices. So of course, I am currently wondering whether I should stay in academic math. It’s a question I have been asked and I have asked myself way more often than my more successful or more white-male-type colleagues have (as far as I can tell). When you don’t fit in, whenever there is some sort of friction, suddenly you have to justify your continued presence. I wasn’t always wondering if I should do math. In fact, I loved math and was comfortable being associated with math for my entire childhood. College was the first time I hit a set-back. I immediately quit math and moved on with my life. That is, until I un-quit and decided to go to graduate school. Ever since then, I have had two strong and conflicting feelings about being in math. 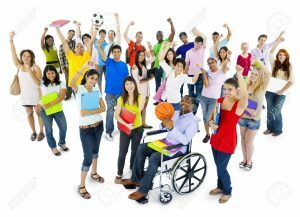 Guest post by Dr. Mike Egan of Augustana College. These messages can readily be taken as an affront to members of the predominantly white American teaching force that serve a majority non-white population of students. Speaking for myself as one member of this force, I must acknowledge a feeling of defensiveness come on as far as Coates’ words might be applied to my own practice. I accept my imperfections as a teacher, but surely I’m no agent of fear and violence, right? 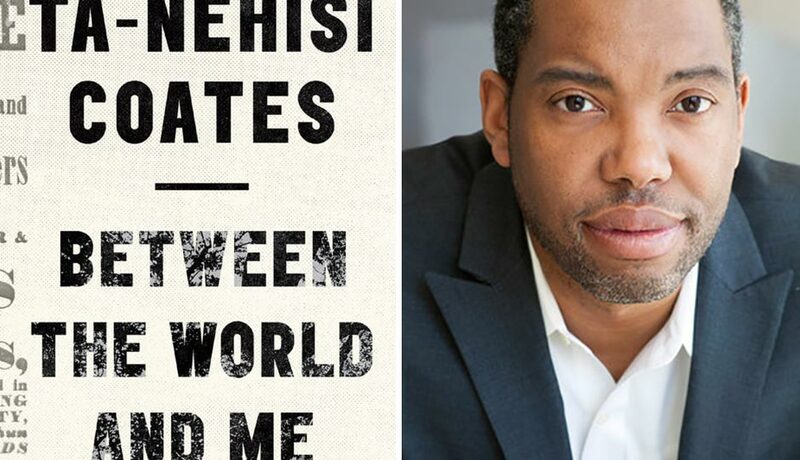 My defensive impulse subsides when I recognize that Coates is not pointing directly at my classroom, but rather at a collective system that effectively serves to maintain the privileges of some while limiting or outright damaging the humanity of others. I have come to take ownership of the painful and unfortunate fact that, as a (White) teacher in this system, I am a contributor to its unjust totality. 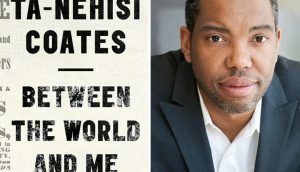 I suspect that White readers of this blog have arrived at similar conclusions, and perhaps share my view that we must develop a critical mass of justice-minded White folks who will acknowledge the dehumanizing effects of institutional racism and collectively work at the side of all who seek justice to dismantle a system built on White privilege. As many of us look forward to the sense of community at the Joint Meetings this week, we should remember that conferences include many situations that are fraught with the danger of harassment and alienation, especially for people in our community with less power or privilege. We can be better. This short post was inspired by the attention that has recently publicized harassment and marginalization issues at Political Science, Psychology, and other disciplinary conferences. Below, you will find list of articles, ranging from first-person narratives to survey research to suggestions for code-of-conduct policies. Because the articles below are from other disciplines, I thought I would share three short anecdotes that I have observed at math conferences to help connect with these articles. 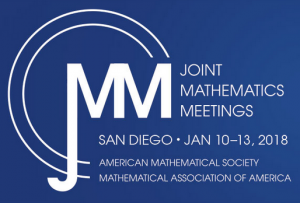 A little thing called the Joint Mathematics Meetings is happening in San Diego next week. How little? I got some data from the Public Awareness Office of the AMS , and they are estimating about 6000 attendees, and over 3000 presentations! If you read this blog, you probably care about issues of equity, inclusion, justice, and diversity in the mathematical sciences, so we thought we would help you out with your JMM planning by sifting through the program and selecting the activities that closely fit these descriptions. The PA Office actually did some of this legwork already in their virtual pressroom, so there will be some overlap with the information there, but I thought I would also classify things a bit further and add a few things of interest. Just to explain my decision process, I went through the full program (starting on Wednesday) and chose either events that were explicitly about equity, inclusion, diversity, and social justice, or events promoted by groups that primarily support underrepresented mathematicians (like the Association for Women in Mathematics and the National Association of Mathematicians). By “events” I mean invited addresses, special sessions, panels, social events, and minicourses. There could potentially be a talk about equity in math education in a flipped math special session, for example, but I didn’t sift through the program that carefully. So if there is something I missed that you think should get some attention and promotion, please share in the comments section below. And hope to see you all at the JMM (where I will be blogging with some very cool people: Kelsey Houston Edwards, Beth Malmskog, Karen Saxe, and Ben Thompson). Last week, Bates hosted speaker Susan Burch, from Middlebury College, for a workshop called “Learning for EveryBody: Inclusive Teaching and Curricular Practices”. I was lucky enough to be able to participate in the interactive session and later have dinner with the speaker, and in this post, I wanted to first share some of the main ideas from the workshop, and also some of my own ideas on how this could be applied to the mathematics classroom.